When’s the right time to get your child a smartphone? According to a Pew Research Study, 95% of teens have access to a smartphone, and nearly half of them claim they are online constantly. By this point in time, that number has probably grown. Just 15 years ago, the smartphone didn’t even exist. Now you can’t walk down the street without seeing one being used. Therefore, it’s only a matter of time before your tween asks you for their first connected device, leaving you to make a big decision. Although having a way to communicate with your child at all times is appealing for parents, it’s important to understand that a smartphone is much more than just a communication device. Smartphones give children the power to surf the web freely, exposing them to anything and everything the Internet has to offer. So, when is the right time to get your child a smartphone? Ultimately, this varies among families and individuals. As a parent, you should understand the maturity and responsibility level that is required to safely carry a connected device. Your job is to determine if your child reaches that maturity threshold where they can be trusted online. The following are ways to help determine if your child is ready for a smartphone. Observe their Internet use; are they making smart choices or sharing personal information? You need to make sure your child is practicing healthy Internet use with their safety in mind. If you believe your child isn’t following Internet safety best practices, be sure to educate them on these potential dangers before getting them a phone. If not, they may be at risk for cybercrime such as cyberstalking, identity theft, and cyber bullying. Remember, while our children are connecting with their social communities online, they aren’t having the quality face-to-face time needed for social development. Before getting your child a smartphone, observe their interpersonal skills. If your child struggles in conversation, doesn’t make eye contact, or gets nervous to communicate with others, then maybe reconsider handing them a device. According to Sherry Turkle, author of “Reclaiming Conversation: The Power of Talk in a Digital Age,” 89 percent of Americans say that during their last interaction with another person, they looked at their cell phone. Many children use phones as a way to get out of conversation or to fill awkward gaps; this takes away from social development. Ask your child why they want a phone. If they want it because, “everyone else has one,” or they want or use Snapchat and Instagram, take that into consideration. Their answer will often reflect their maturity, a tell-tale sign if they are ready for a smartphone. If your child does get a smartphone, it is almost unavoidable that they will be joining social media. People can be nasty online, hiding their identity behind keyboards and saying whatever they feel. Can your child properly handle situations in which cyberbullies may be targeting them? Can you handle the idea of your child being bullied online? It is not uncommon and is something to be taken into consideration. To help reduce the chances of exposure to bullying or inappropriate content on media outlets, be sure to activate parental controls and set accounts to private. • When speaking with someone, keep your phone in your pocket and engage in conversation. 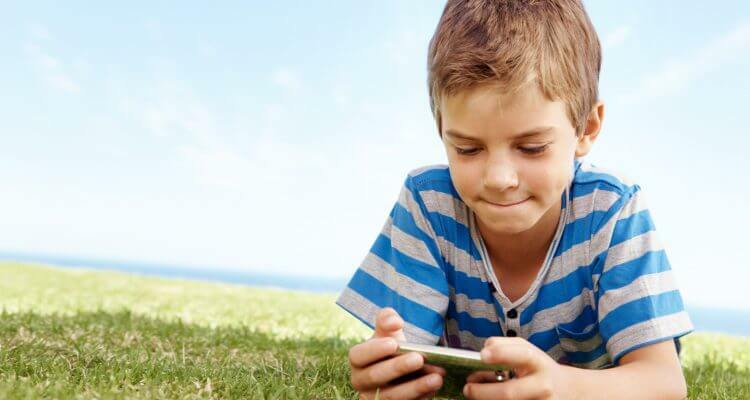 Home Blog When’s the right time to get your child a smartphone?